Starting on the outside and working towards the roots of the client's health and well-being. 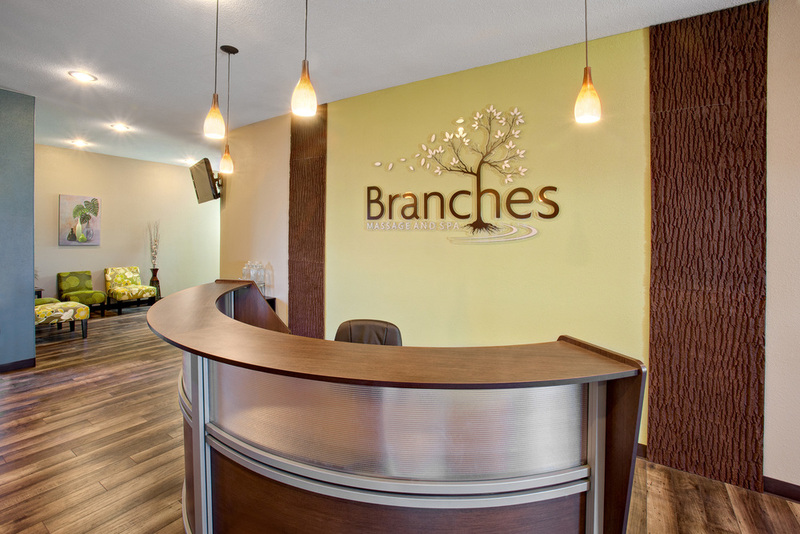 Branches Massage and Spa, Inc. opened its doors in March, 2012. Formally Kellams' Therapeutic Massage, the business saw a need to expand its services and space. Seeing a need in the area to have several services under one roof, its vision began. It's now a beautiful and inviting 3,800 square-foot facility. Our mission statement is "Starting on the outside and working towards the roots of the client's health and well-being." We offer many services including massage therapy, aromatherapy, reflexology, nail services, hair services, facials, body treatments, body wraps, skin care, waxing, eyelash tinting and extensions, laser hair removal, laser vein removal, chemical peels and botox. We're constantly adding new services to meet our clients' every wellness and beauty need. Branches has rental space to accommodate bridal parties, bachelorette parties, girls' night out, small conferences, or any other special occasion. Please stop by anytime to take a tour or to ask about our services. We look forward to meeting you! Vary by staff member. Contact us to schedule an appointment. New to Microblading? Click here to learn more! New to Functional Body Enhancement? Click here to learn more! What are the hours of operation for Branches Massage & Spa? Our hours vary by staff. Please contact your staff member or Branches Massage and Spa at (217) 347-2190. Or feel free to send us a message using the contact form down below, or contact us through Facebook. The HydraFacial treatment is the newest advance in non-laser skin resurfacing, one step above IPL. HydraFacial is the only hydradermabrasion procedure that combines cleansing, exfoliation, extraction, hydration, and antioxidant protection simultaneously, resulting in clearer, more beautiful skin with no discomfort or downtime. The treatment is soothing, moisturizing, non-invasive and non-irritating. The HydraFacial treatment improves the appearance of fine lines, wrinkles, congested and enlarged pores, oily or acne prone skin, hyperpigmentation, and age spots. It is suitable for most skin types including thin or aging skin, ethnic skin, and dry or oily skin. Dramatic improvements can be achieved with just one treatment. Results are accumulative and a monthly treatment is recommended to maintain a healthy, youthful appearance. Image Skincare is an evidence-based clinical skin care company providing effective skin care solutions for every skin type. A good skin care regimen at home can enhance and lengthen the results of a professional skin treatment that is why I am excited to retail Image Skincare products at Branches. The full line of skin care contains NO petrochemicals and no parabens or other chemical preservatives. Chemical peels: A chemical peel will be chosen depending on your skin type and condition, lifestyle, and skin care goals.Lift your skin to a new level of health by targeting your skin concern. Image Skincare face peels effectively treat wrinkles, blemishes, and uneven skin pigmentation. Our wide variety of chemical peels can take you from light to medium depth and can be completely customized. Enhancements or boosters: Image Skincare offers a variety of chemical peel “boosters” to customize and enhance your peel experience. These enhancements will be chosen to specifically formulate a chemical peel to better serve your skin. Oxygen infusion: This unique treatment combines three services into one leaving your skin immediately refreshed and glowing. You first choose between Microdermabrasion or Dermaplaning. After your skin is exfoliated the Oxygen Infusion begins with the application of 96% oxygen combined with a customized serum to hydrate, promote cellular regeneration, level skin tone, kill acne causing bacteria, and reduce fine lines. The treatment ends with a customized LED Facial Therapy session complete with a shoulder and neck massage. LED facial therapy: LED therapy encourages collagen production, smoothes fine lines and wrinkles, improves texture, minimizes inflammation and redness, and diminishes acne. The session will take 30 minutes and includes a neck and shoulder massage. Multiple sessions are more effective and recommended for best results. Microblading is permanent makeup technique used to enhance your brows regardless of the amount of hair present. The results are natural, fuller, brows. Click here to learn more! Call (217) 347–2190 to book your appointment. Have any questions? Feel free to call or fill out the contact form below. We look forward to hearing from you! Is it okay if we text you?